Milan Rašić, world classic, one of the most significant self-taught visionaries in Serbia died in Belgrade at the age of 87 on Tuesday, 10 April 2018. He was born in Donje Štiplje near Jagodina as the eighth child to a patriarchal peasant family on 7 March 1931. The early period of his childhood remained an instinctive inspiring motive that impelled him to create. He began doing painting more actively in 1950. He took one of the most prominent places in the generation that appeared after Janko Brašić. His recognizable style and ornamentally descriptive approach to the presentation of landscapes showed the artist’s idealized image of reality, the reminiscences of his childhood. 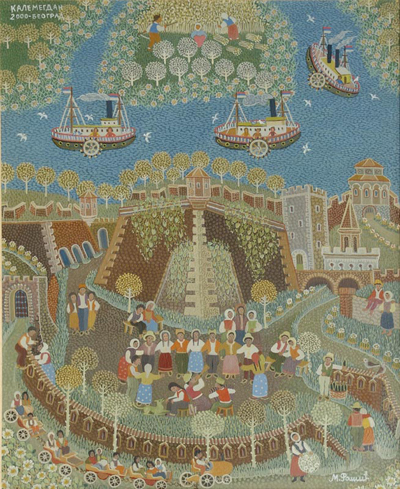 A strong individuality and unique formula of pictorial expression of Milan Rašić made our naïve art famous for its authenticity worldwide. 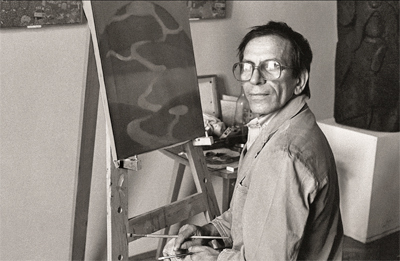 Elevated by nature and strength of people in a community, with his stories of life in the past, Rašić became the metaphor of self-taught visionary art of Serbia and an unavoidable creator of specific aesthetic principles within the continuity of the self-taught art in wider European domain. Peacefully presented events, shaped in balanced wholes and monasteries as pearls of our medieval culture were his permanent inspiration. He dedicated hundreds of his works to the region of Pomoravlje, our monasteries throughout Serbia, Belgrade, picturesque landscapes of Crni Vrh, most of which being exhibited at well-known galleries and museums worldwide. Artistically logical and skillfully efficient, in the process which developed spontaneously as an expression of his joy of creation from the bird’s perspective, Rašić remained to float above his landscapes. Rašić’s contribution to first exhibitions of Serbian self-taught visionaries is immeasurable; he thus promoted the phenomenon of authentic power of naïve art in Serbia at the most competent international exhibitions in the world in nineteen sixties and seventies, under the protection of his temple, Museum of Naïve and Marginal Art which remained the richest treasure of his realisations. In the memory of this great artist, Museum of Nave and Marginal Art in Jagodina is organising the exhibition of his works entitled In Commemoration of Milan Rašić, which will be open until 31 May 2018.